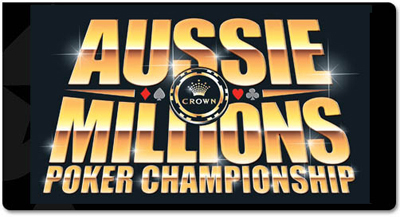 Aussie Millions is among the most anticipated poker tournaments held every year in Australia. To the very delight of Australia-based poker enthusiasts, the 2016 schedule has just been unveiled. It will be played from January 13 to February 1, 2016. As is the tradition, Melbournes Crown Casino is playing host to the series. Actually, the 2016Aussie Millions schedule features 24 events to be held in Crown Casinos poker room. The most important of all, the AU $ 10,600 buy-in Main Event, is slated to kick off on Sunday January 24, 2016. It will run three starting day flights with the eventual winner to emerge on January 31, 2016. Alongside the trophy and the top payday, the champion will be given a seat to the Asia-Pacific Poker Tour festival. In the menu at the 2016 Aussie Millions are enticing yet lower buy-in events for all levels of players. For the notables and high stakes fans, the schedule includes a $ 250,000 buy-in Super High Roller kicking off on January 31, 2016. Plus, there are two other Challenge events, namely a $ 100,000 and a $ 25,000 of entry-fees dedicated to high-stakes elites and players alike. The $ 2,500 buy-in Pot-Limit Omaha, the $ 1,150 buy-in Aussie Millions Tournament of Champions, the $ 1,500 Deepo Freeze, the $ 2,500 HORSE and the Six-Max No-Limit Hold'm Shot Clock are among the highlight events in this Australian poker festival. Needless to say, the $ 1,150 buy-in $ 1 million Guarantee NLHE is listed as the inaugural event.